Over time, new pools are created in homesteads and commercial places. This is something we have learnt to adapt to by expanding our pool drain service. We beat our competitors by far given the high number of technicians our company has plus many years of experience in pool maintenance. We have the cure for all your pool issues from staining, foaming, algae, among others. Get in touch with our experts by calling ​(925) 269-9399 now. Call (925) 269-9399 for free estimates. What Causes Algae in Pools? Insufficient filtration: the clarity of water in a swimming pool depends on daily filtration and circulation. If something inhibits the flow of water to the filter, encourages the growth of algae. Some circulation inhibitors include damaged filters, dirty skimmer baskets, faulty pump motor, and so on. The main sign of poor infiltration is hazy water which causes rapid blooming of algae. Little or no chlorine: algae do well where pool is not treated with chlorine. Chlorine can be lost through a number of effects such as high temperature, heavy downpour, sunlight, high pool turnover rate. To protect chlorine from the adverse conditions, we help pool owners through super-chlorination combined with conditioning and stabilization. Dirty pool: algae prefer messy pools. If debris accumulate at the bottom of a pool for a long time, the problem becomes worse because staining will occur too. We can help you prevent algae formation through pH control techniques and disinfection. It is unfortunate that pools provide the ideal conditions for algae growth which include oxygen, phosphorous, carbon, nitrogen, which are further supported by sunlight and warm temperatures. Our treatment starts with pool draining followed by thorough cleaning. Then we apply suitable products such as chlorine to disinfect the pool. Pool stains are caused by organic or metallic substances in water. We know the source of stain by looking at its color. 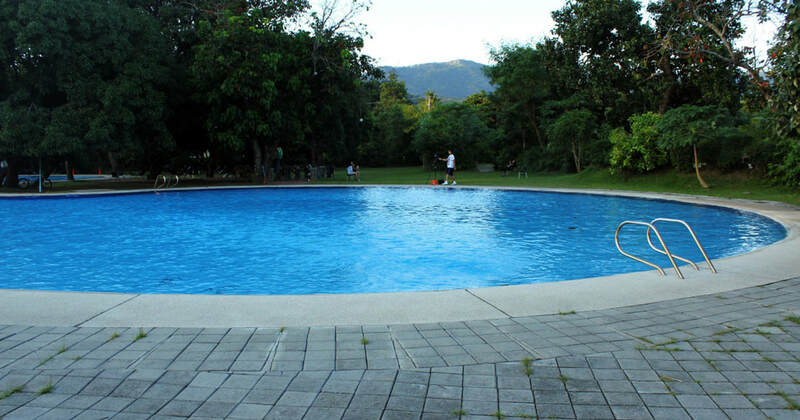 The green or brown stains on pool walls and floors are due to organic materials like leaves particularly during cold seasons or even algae formation. To remove the stains, we thoroughly scrub the surface and apply ascorbic acid. If the stain is along the water line, we use vinyl cleaners or an appropriate tile to scrub off the dirt. We may also use enzyme-based cleaners which eat away any oils attached to the water line without necessarily scrubbing the pool. Reddish, black, or brown stains are connected to metallic elements inside the pool. The common metallic stains come from manganese, copper, and iron. Sometimes a swimmer may carry the stains in their hair or attires. Copper stains appear green, dark or blue; manganese stains are purplish, brown, or dark; while iron stains are brown, rusty, or green. The metallic stains occur naturally in any water especially hard water. Uncontrolled alkalinity encourages introduction of metals into the pool which brings about corrosive effects. A corrosive pool causes pilling of the pool plumbing, causing the release of metals into the water since the plumbing is mostly composed of copper. The first thing we do to eliminate metallic stains is by testing first the type of metal causing the problem and the causative factor. Depending on the extent of damage we can drain the pool partially or fully. We apply ascorbic acid or a pH reducer. The pH reducer is put inside a sock which is then dropped into the pool and left for about 10 minutes. Then we refill it with fresh water which has been tested and proven to be metallic-free. We can help you test for presence of these elements if you speak to us today on (925) 269-9399.